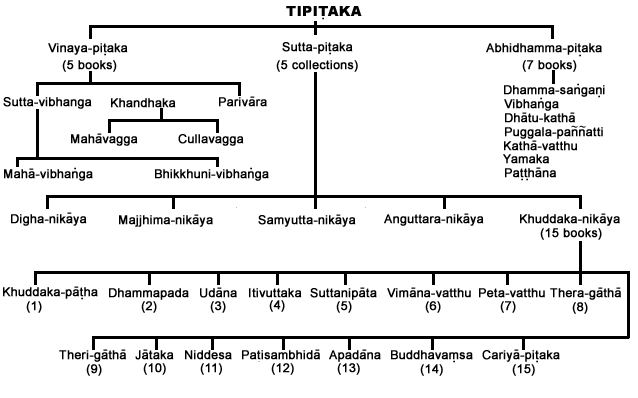 WHAT IS THE SUTTANTA PITAKA? and moral progress of the lay disciples. perfect protection from being misconstrued. Nikæya, A³guttara Nikæya and Khuddaka Nikæya. in the Teaching of the Buddha. his Teaching were the two merchant brothers, Tapussa and Bhallika. his Enlightenment. The two merchants offered him honey rice cakes. right attitude of mind with which an offering is to be made for spiritual uplift. over to the donee - Muñca Cetana, volition during the act. determine the nature of the result thereof. of charity should be performed. Examples abound in the discourses concerning charity and modes of giving alms. (i) I undertake to observe the precept of abstaining from killing. (ii) I undertake to observe the precept of abstaining from stealing. (iii) I undertake to observe the precept of abstaining from sexual misconduct. (iv) I undertake to observe the precept of abstaining from telling lies. intoxicants that becloud the mind. Every precept laid down in the formula has these two aspects. Samædhi purity of mind through concentration-meditation. transcend the state of woe and sorrow. further develop until it attains one-pointedness of mind. meditation upon one of the subjects recommended for the purpose by the Buddha. development of Insight Knowledge, Vipassana Ñana, as a direct path to Nibbana. Suffering (Dukkha) and Non-Self (Anatta). æsavas, the cessation of asavas and the path leading to the cessation of the asavas. for him to do for such realization. Calm and Insight) as laid down in numerous suttas of the Suttanta Pitaka. 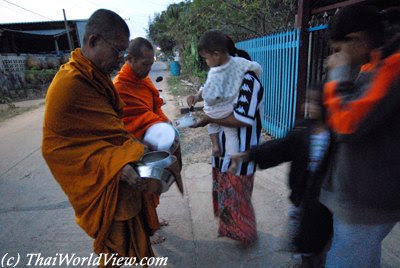 ตักบาตร or “TAK BAT” means giving alms to monks. 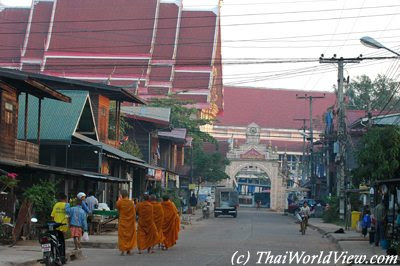 temple abbot leads the monks. 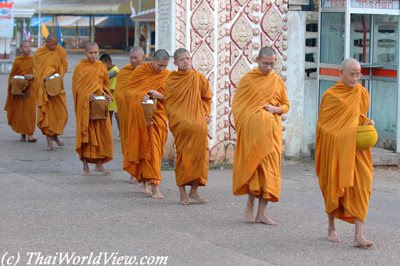 The other one follows by seniority age spent in Buddhist community. 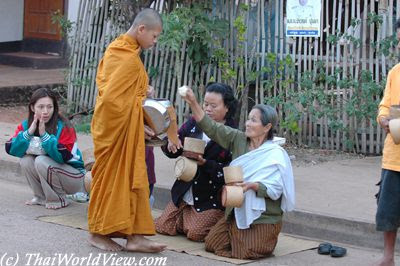 Thai women, kneeling, or Thai men, standing, put food inside the monk’s bowl. 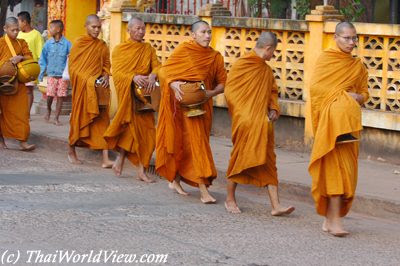 The women cannot touch the monks or his belongings. the abbots agree together on the path reserved for each temple. do good deeds and earn merits. 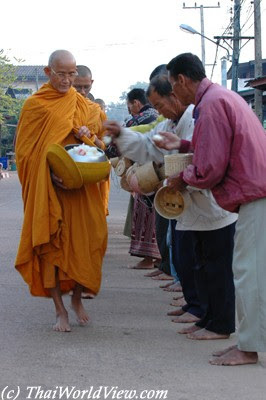 Alms bowl (บาตร) is the monk’s emblem. 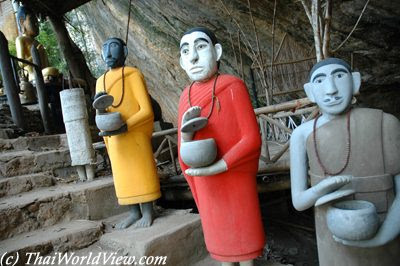 According to Buddhist rules, it is the only dish that monks can possess. and put food inside the bowl. The monk shall not look at the women, neither thank them. No words are said. If a young novice receives food from his mother, he can bless her. 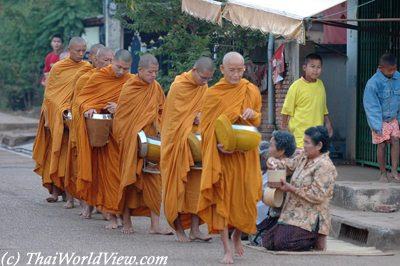 The monks walk bare foot and shall accept any food given to them. on it in order that laypeople can put a few last food offerings on the lid. Traditionaly, rice offered shall be recently cooked rice. through a small ceremony called “KRUAT NAM” (กรวดน้ำ). 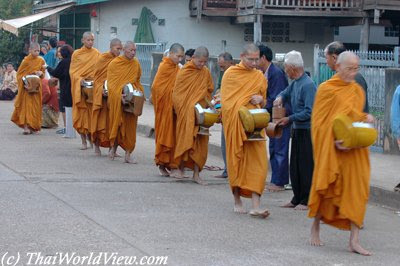 Traditionaly, if a monk bowl falls in front of a house, it is seen as a bad omen. birthday and so on… On such occasion, they can request a blessing from the monks. The page you requested has been moved or no longer exists. You may wish to visit our home page to see what’s new or use the search box to try to locate the document you were seeking.